Expedited linehaul LTL service provider chooses the LTL Cost Information System for profitability analysis. TCG’s methodology uses a similar approach to our pricing structure, so they understand what we need and provide the right tools to evaluate our profitability. Forward Air is a leading asset-light freight and logistics company that provides LTL, truckload, intermodal and pool distribution services across the United States and Canada. The company’s Expedited LTL service operates from more than 90 facilities and 12 regional sort centers located at or near major U.S. and Canadian airports. LTL/CIS contains unit costs and statistics developed directly from a general ledger and operating data. Carriers using LTL/CIS for pricing may also have a separate model with budgeted or projected unit costs, and a separate record for each terminal containing specific unit costs. LTL/CIS is available as a standalone or LAN system for Microsoft Windows operating systems. SMC³ is the one-stop knowledge hub for LTL technology, data and education. The API-powered SMC³ Platform fuels TMS applications with unrivaled LTL analytical capabilities and shipment visibility data. 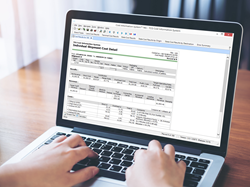 TCG, an SMC³ company, is the premier Activity-Based Costing and Profitability Management software provider for the Truckload and Less-than-Truckload Carrier looking to achieve superior profitability. Transportation Costing Group is the provider of the most widely used suite of Profitability Management Tools and activity-based costing models to the motor carrier industry. TCG provides models tailored to specific carrier operations. For general product information, visit http://www.TCGCIS.com.